The Republic of Singapore Air Force (RSAF) has awarded a service contract to Lockheed Martin Simulation, Training and Support (LMSTS) to support the RSAF's Basic Wings training course in Pearce, Australia with Pilatus PC-21 aircraft. The Basic Wings Course equips RSAF pilots with the knowledge and skills of basic flying before they progress to advanced aircraft training. As part of the contract, LMSTS will supply and maintain a fleet of Pilatus PC-21 aircraft and a suite of ground-based training systems that meet the RSAF's requirements for its Basic Wings Course. This will allow the RSAF to focus on the core business of flying training. 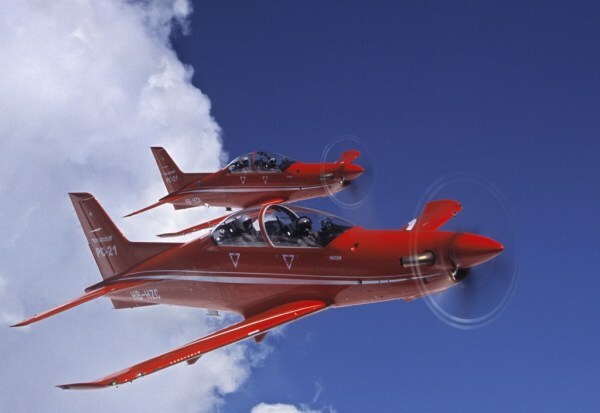 Pilatus Aircraft Ltd will supply the PC-21 Advanced Turboprop Trainer Aircraft for the Republic of Singapore Air Force (RSAF) Basic Wings Course (BWC). Lockheed Martin was awarded a 20-year contract by the Singapore Ministry of Defence’s Defence Science and Technology Agency (DSTA) to operate the RSAF BWC. This was the first open competition in which the PC-21 has participated. Nineteen PC-21 Advanced Turboprop Trainer Aircraft and a 20-year engineering and logistics support service will be provided by Pilatus as part of a turn-key training package awarded to Lockheed Martin Simulation, Training and Support (LMSTS). The training will be conducted at the Royal Australian Air Force Base Pearce, north of Perth in Western Australia. The contract is for the provision of Pilot and Weapons System Operator ground-school, simulator hours and flying for a period of 20 years commencing June 2008. LMSTS is the Prime Contractor and has been working with Pilatus since 2004 to develop the winning solution. Hawker Pacific Pty Ltd. will provide aircraft maintenance services to Pilatus to enable Pilatus to generate the flying hour task. ORLANDO, FL. --- Lockheed Martin was awarded a 20-year contract by the Singapore Defence Science and Technology Agency to support the Republic of Singapore Air Force (RSAF) Basic Wings Course (BWC). Lockheed Martin’s role as the BWC training systems integrator is to provide aircraft, maintenance, simulators, courseware and ground-based instructors to the RSAF’s 130 Squadron at Royal Australian Air Force Base Pearce, north of Perth in Western Australia. BWC allows the squadron to concentrate solely on high quality flight instruction. Switzerland-based Pilatus Aircraft Ltd. will deliver the advanced PC-21 turboprop trainer and logistics support, while Hawker Pacific Ltd. will provide maintenance support. The contract calls for a two-phased approach for BWC – a mobilization phase and a service provision phase. In the mobilization phase, Lockheed Martin will manage the aircraft production and training system components development, and establish a BWC maintenance organization. Aircraft will be delivered in early 2008 and Lockheed Martin will begin the service provision in the summer of 2008, providing BWC support for 20 years. Lockheed Martin has a rich history of pilot, aircrew and maintenance training. The company manages programs for the U.S. Air Force Special Operations Command; provides training for C-130, F-15, F-16, and F-22 crews; and is developing the pilot and maintenance training programs for the F-35 Lightning II.